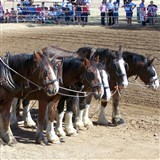 The Gatton Heavy Horse Field Day is an opportunity to come and see the Heavy Horses that built our nation. See the working team ploughing, beautiful and decorated harness displays, obstacle courses, breed judging and riding events in dressage, and much more. Other highlights are working demonstrations of horse drawn machinery and the ever popular World Cup Shoeing Competition. Take time to purchase your own lunch today as you stroll around the grounds. Morning tea and entry are included.